Anthropologie's Plaza cardigan by Moth retailed for $128 and came in a variety of colors but is no longer available. 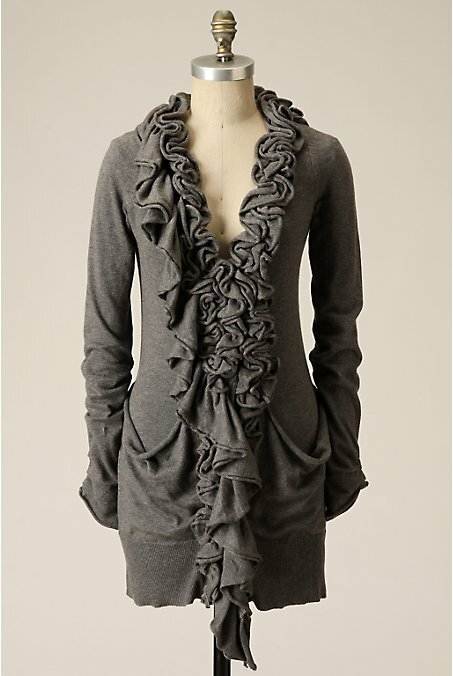 Although the ruffles are slightly smaller, this INC International Concepts ruffled cardigan reminded me of the Anthro version above. It retails for $79 and you can click on the photo below if you're interested in purchasing (also available in charcoal grey or mink). Blue Tassel has an even closer option for $89 at Zappos, and it's available in a bunch of additional colors like teal, oatmeal, black, and ivory. Click on the photo below to purchase. I love this cardy, the color especially and and for the price it rocks! Belk also has a copy in brand Madison. Shorter than the original but I bought it for my sister and she loved it. I have the Anthro one, and I liked them about equally. Gigi - Love the pics of the INC version on you! T - Thanks for the info! Nice find! I actually prefer the look of the INC version. 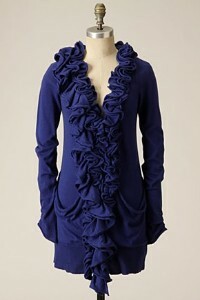 I am an anthro-fiend, but the ruffles were a little overwhelming IMO on the plaza cardi. It's a little different because it has an asymmetrical hemline and less ruffles, but it's a good "inspired by" for those of us on a budget.